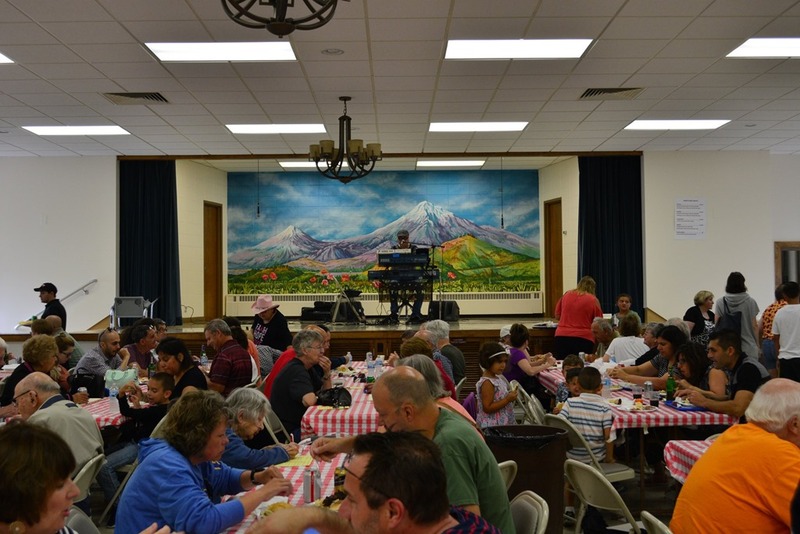 On July 22, St. John the Baptist Armenian Church in Greenfield, WI, held Milwaukee’s annual Armenian Fest. The festival has grown in recent years from its origins as a church-family picnic into a regionally recognized event that draws attention from the local news media and has gained a large non-Armenian audience. The lack of leftover food from this year’s Armenian Fest is an indicator that 2018 was the event’s most successful year to date. Armenian Fest’s main attraction remains the food. The offerings are almost entirely homemade from old family recipes and include pilaf, boreg, sarma, yalanjee, hummus and desserts such as paklava and borma as well as beef and chicken shish-kabobs grilled over an open fire. But the festival also kept the crowd engaged with live music by Chicago’s Hye Vibes, Racine’s Stepan Froonjian and performances by Chicago’s Hamazkayin Sardarabad Dancers. Armenian wine, beer, preserves and honey were sold along with books, CDs and t-shirts. Armenian Fest has become the Milwaukee Armenian community’s opportunity to give southeastern Wisconsin a taste of Armenian food, culture and hospitality.